Hannah Grimley from Pushing Into Joy, and I met through our writers' group Hope Writers. She graciously agreed to share a memory with us and I was thrilled. She has recently published her first book Pushing Into Joy and you can join me in making it one of your summer reads. She is a wife and mom of two. She teaches school, is a health advocate, and a blogger. She is a photo lover so be sure to follow her @hrgrimley. But her heart also is to encourage people on a journey toward wholeness, health and the best versions of themselves. Hannah's share is a delightful reminder that summer is something to be enjoyed completely. We can allow all our senses to welcome and embrace this season...enjoy! Summer, for me, revolves around the five senses. The feeling of sun on my skin, wind in my hair, and sand or grass between my toes. The smell of water or a bonfire’s smoke wafting along with the smell of the grill. The sound of birds chirping, children giggling, and the fire crackling. The sight of my loved ones filling their cups with fun and rest and time together. Perhaps my favorite sense is taste. The taste of summer to me is grilled meat, roasted veggies, fresh fruit, chilled drinks, and last but certainly not least the S’mores. Over the last few summers a new tradition has been formed. It started with my sister-in-law, Hailey’s, Reese’s Peanut Butter cup addiction paired with my love of S’mores. We decided to get experimental with our bonfire desserts. It started simple. Instead of chocolate - a Reese’s. Delicious. Next time we tried replacing the graham cracker with fudge striped cookies, can’t go wrong with a fudge striped cookie. A week later, we tried what became my all time favorite, a strawberry - dipped in chocolate - and then stuck into a roasted marshmallow. To die for! Don’t even get me started on the traditional S’more with bacon. Mouth. Watering. Goodness. As soon as bonfire season is here, we begin sending each other pinterest ideas and we assign ingredient lists. Each bonfire of the summer we try a new mixture of crunchy and sweet, and we are always left wanting s’more. These kinds of traditions are my favorite. Simple. Cheap. Filled with time together, messy fingers, and happy stomachs. 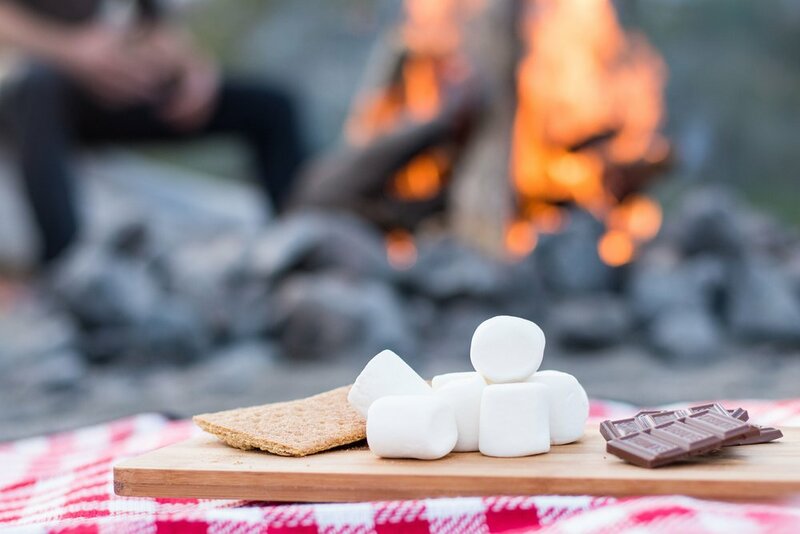 If you want more to go with these smore ideas check out this article S'mores Revisited in the Desserts for the Win section. If you enjoy cooking with your kiddos check out some more of our recipes including one the Elizabeth Jane can make, Chicken and Cheese Roll-Ups. The outdoors your thing? Check out Outdoors in the Summer and Summer Adventures Don't Have to Be Fancy.